Strike a pose – Quads in vogue! 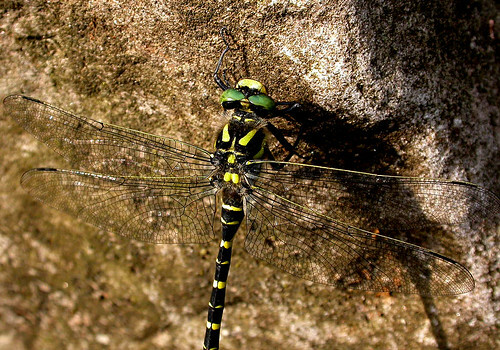 Summer 1992, Ynys-Hir in Powys, Wales opened my eyes to the world of Odonata – the Golden-ringed Dragonfly Cordulegaster boltonii – a simply superb insect. I saw a few species during my stint doing volunteer work over the summer holidays that year post exams and just before college. Even now, over 20 years later, I still consider going to see them in Yorkshire an annual treat when time allows. 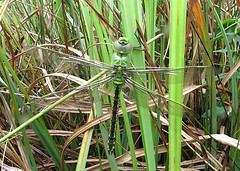 Post 1992, and with a little bit of research through reading the books available at college, a few years later I was enjoying the delights of such species as Hairy Dragonfly Brachytron pratense and Emperor Dragonfly Anax imperator during ornithological survey work in Suffolk – a welcome distraction to quiet days in the field. However, it was the spring of 1997 when I bought my first book, the superb field guide I still use now which was written by Steve Brooks and illustrated by Richard Lewington. It is a book that has been well used… a book that not only made Odonata more accessible with the great text and English names, but also the key identification marks drawn to scale on the illustrations. Having arrived back home in Yorkshire early in 2000, time was spent both birding and looking at Odonata – the latter group perhaps being looked at more seriously for the first time, especially at Tophill Low NR, East Yorks. 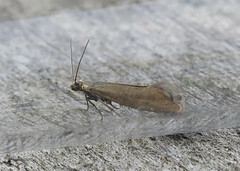 Coupled with the enthusiasm of Paul Ashton and Doug Fairweather, numerous records were collected from various Yorkshire sites, and during 2005, Paul Ashton came up with the idea of creating an Odonata Atlas for VC61 which several years later became a published article. Something we both hope will be used by others for reference and as inspiration for people interested in Odonata and those who wish to create an atlas for their region. 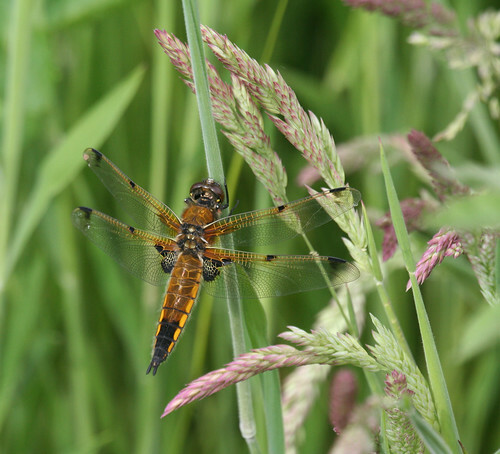 One of the commonest large dragonfly species in Yorkshire during the early part of the season is the Four-spotted Chaser Libellula quadrimaculata, the photo below being of the form praenublia taken at Tophill Low NR a couple of years ago during the atlas survey work. 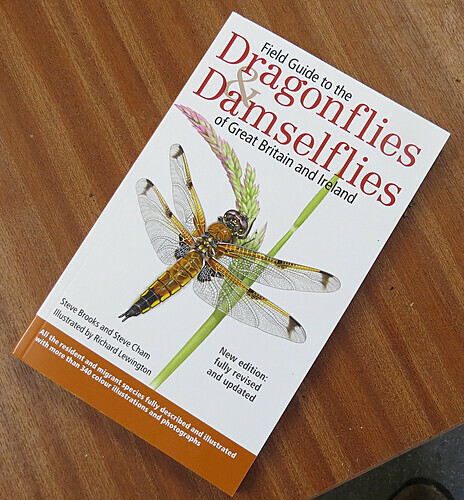 A few months back, it came as something as surprise to receive an email from one of Europe’s most respected wildlife artists Richard Lewington asking to use the photo, with artistic licence, as the illustration for the new edition of the Field Guide to the Dragonflies & Damselflies of Great Britain and Ireland. 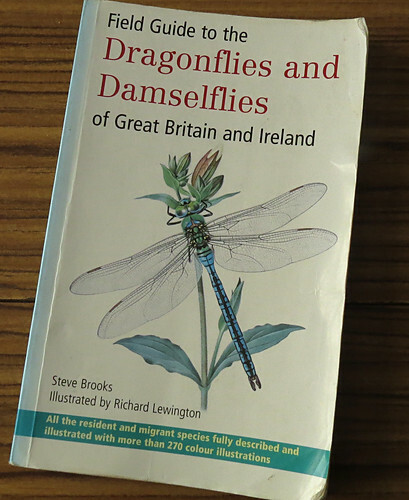 The new book features updated maps of species distribution and new illustrations of species not featured in the original book published back in 1997 – Odonata in Britain and Ireland has changed a lot since then… just as it has here in Yorkshire as the last 14 years has proved. I hope the book inspires others, the same as the original inspired me. The first book featured a stunning illustration of the fantastic Emperor on the front cover, the new one features a stunning picture of the humble Four-spotted Chaser – a species many will see, and one that is equally as stunning as the Emperor, you’ve just got to take the time to look and go ‘Wow!’. Away from books, perhaps an interest wouldn’t be an interest without the encouragement, friendship and help of others… my thanks go to Paul Ashton, Doug Fairweather and Nuno de Santos Loureiro for both allowing me to spend time in the field with them, learning with and being inspired by them, and allowing me to collaborate with and contribute to their projects both here in Yorkshire and the Algarve, Portugal when time has allowed over the years. Finally, thank you to Richard Lewington for looking at my blog and finding a photo that inspired… hopefully next summer will see lots of Quads strike a pose! Lets hope they inspire people like the Emperor!